What’s My Next Big Project? I’ve been itching to make a sweater for myself. I’m thinking about this in July because I might just be able to finish it by winter if I start now. The last one I made has been destroyed and I’m still not ready to talk about it. I’ve been considering what type of sweater to make for myself. 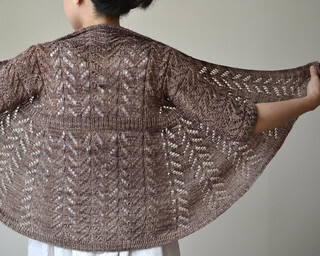 There are lots and lots and lots of lovely patterns out there that have caught my eye and are resting in my Ravelry queue, but lovely won’t matter if I don’t have an occasion to wear it. My style, if you can call it that, is very casual. Even when I was working in an office, I didn’t often have the need to wear more than decent slacks and a non-t-shirt. As a stay-at-home mom, though… well, I usually manage to change my t-shirt once a day and I don’t wear my yoga pants if I’m planning to leave my yard. Before I drop the money on a sweater’s worth of yarn, I need to make sure I think through my yarn and pattern choices carefully. I don’t want to spend $200 or more on yarn for a sweater I won’t wear. I need something that is versatile and comfy. Cable work is cozy and always fun to do. I love lace work, but too much lace would make it impractical for my needs. 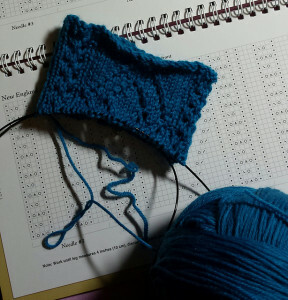 So I’ll be looking for a pattern that highlights interesting cables with perhaps a touch of lace. I want something long-sleeved, but modifying a pattern with short- or 3/4- length sleeves shouldn’t be too difficult. I am broad-shouldered and I have very long arms (according to the fashion industry, anyway) so I need a pattern that will fit across my shoulders and be easily lengthened in the arms. One of the perks of knitted fabric is that it stretches, so I can take advantage of that to find a size that fits without being too tight across my back. I want the sweater to be hip-length, which may require lengthening the body some. Lastly, I think a hood would be nice, but I have plenty of warm hats and scarves, so a hood isn’t absolutely necessary. I’m planning for it to be my all-the-time sweater, so I’ll be wearing around the house as well as out and about. For that, I need it to be easy-care. I like natural fibers but each has their pros and cons. Cotton would be nice, but much heavier than wool and would be more likely to stretch out of shape. Alpaca is soft, warm and luxurious, but it has the same problem as cotton when it comes to stretching out of shape. I love wearing wool, but perhaps a superwash wool would fit my care requirements while still giving me the natural fiber I want. 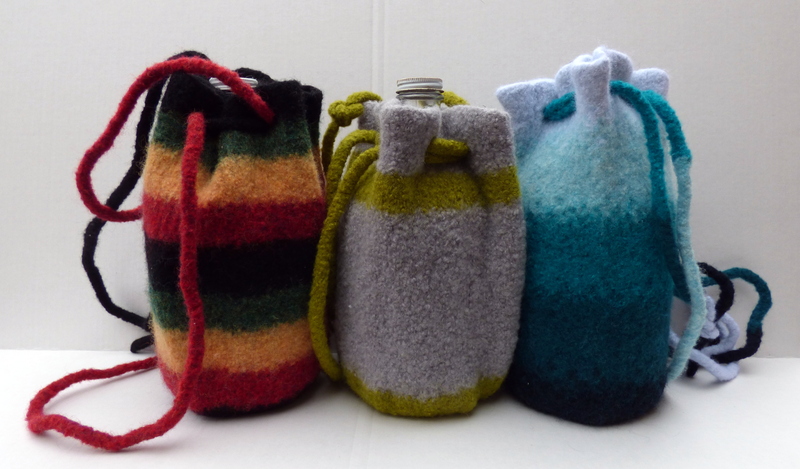 I do have a sweater-quantity of superwash wool in my stash. I’m not 100% sure it’s the color I want, though, but I am 100% sure I don’t have quite enough for a sweater for me. If I use this yarn, I’ll have to add more to it, so I’ll have to decide on a color that coordinates and a pattern that will allow me to use two colors without being weird. There’s the always classic and very popular February Lady Sweater. It looks great on any body type. I really love this Hitofude cardigan. 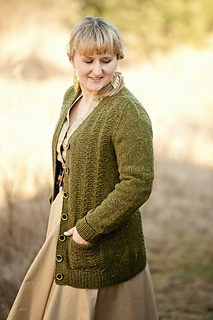 Although lacy, it could be warm and cozy in a lovely wool yarn. The Vodka Gimlet is minimalist in its details, but looks like a comfy and timeless choice. This one would be easily lengthened in the arms and body. The Yakushima is beautiful and looks so cozy. The design is repetitive, which can get boring to work on, but I’m betting it would be easy to memorize and perfect for TV knitting. And then there’s Merle. Lots and lots of plain stockinette, but I do really like the collar/front band detail. There are more of my favorite ideas in this Ravelry Bundle. There are a few that I am leaning toward, but I wonder which is your favorite? Ahh, summer. Oppressive heat and humidity alternating with dangerous storms. Skyrocketing electric bills and flying, stinging creatures that hate the lawn mower as much as you do. This part of the year, all I really want to do is sit in my cool little nest and knit. Fortunately, I’ve had the chance to do that quite a bit this past week. 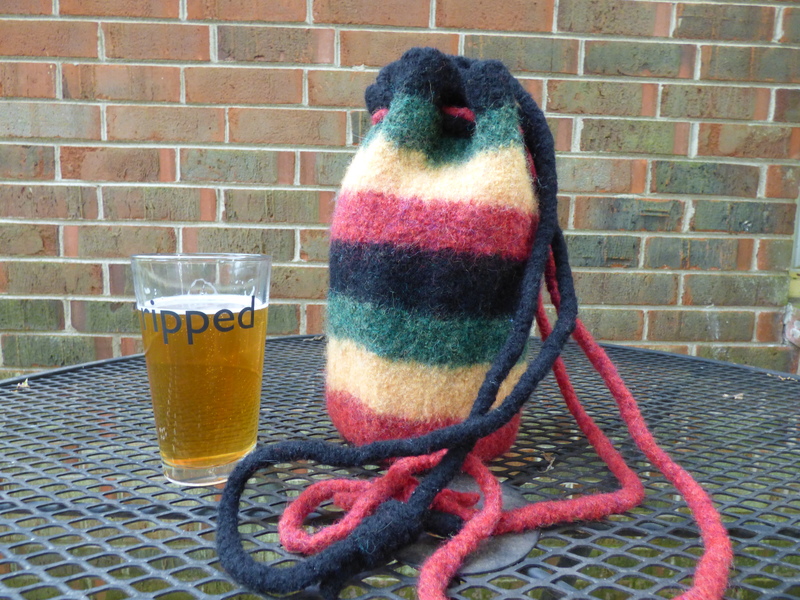 I was thinking back trying to figure out what I’ve done the last couple of months, because I couldn’t recall actually knitting much. I think that’s pretty neat. When I finished that, I tried to work on another cross stitch project, but I wasn’t as interested. I think the cross stitch bug just ran its course and I was really craving knitting again. Anyway, apparently that didn’t satisfy my need for a lace project. 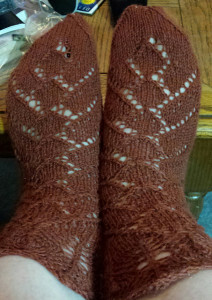 I cast on a pair of Friday Harbor socks right away and finished them in about 3 days. This pattern had quite a few firsts for me. It’s my first pair of top-down socks. It’s also my first pair of not-just-ribbing socks. I was so pleased with those socks, I cast on another pair of socks from the same book. I am now working on a pair of New England socks. My current car project is a pair of socks that I’m not really loving. The yarn is… well, you can see for yourself that it’s very bright. I think it still *reads* as purple, but the yellow and green certainly stand out. 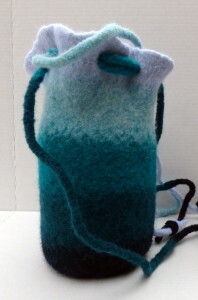 The texture of the yarn is not too pleasant, either. After finishing the previous pair of car project socks, which are my most favorite socks ever, this is like working with bailing twine. 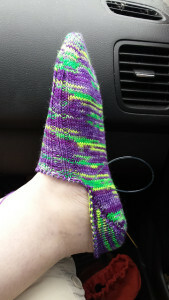 I did try a new style of heel on this sock. It’s called the Fish Lips Kiss heel and it’s really as easy as it claims to be. It took me about an hour to do the first one, while referencing the instructions, but the second one took about 20 minutes. All while in the car! Typically, I have to do the heels in complete quiet so I can concentrate, but once I got the method down with the first, I did the second from memory. I’ll definitely use this heel method again. It seems that I’ve been busy, and I really have! 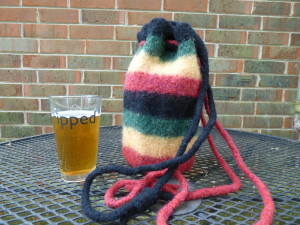 Along with the knitting, there’s the day-to-day keeping up with the two-year-old. I’ve been trying to get some regular exercise, too. 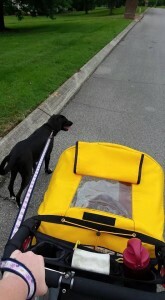 I bought a new-to-me jogging stroller that’s been helping with that. We’ve been doing lots of summery things. Playing at the playground, going to the splash pad, and hiking in the woods. It’s hard for me to sit down when he’s awake, because he’s just going ALL. THE. TIME. Now that we’re in the heart of summer, though, we’ll be finding some indoor activities. We love the science museum, indoor playgrounds and bounce houses for those rainy or extremely hot days. I’ve had a few commission projects to work on, which I’ll tell you about in another post. And I really, really want to make myself a sweater. I started one a long time ago, but it met a really disastrous fate. I’ll tell you that story if I can bear to do it.